Project Raptor, announced and demonstrated at Oracle Open World, this Fall, has now been released (sort of, as it is still an early adopter release). A free download (60Mb) is available, for Windows or other platforms that run a JDK. Project Raptor is a new, free graphical tool that enhances productivity and simplifies database development tasks. 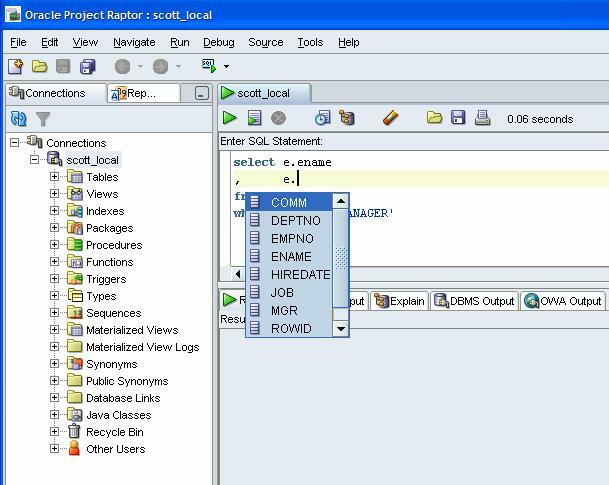 With Project Raptor, you can browse database objects, run SQL statements and SQL scripts, and edit and debug PL/SQL statements. You can also run any number of provided reports, as well as create and save your own. Raptor is direct competition for tools such as TOAD and PL/SQL Developer and joins the ranks of other free tools such as SQuirrel and many others. Note: Raptor is not open source. An Early Adopter release is now available for download for Windows and Linux. Project Raptor can connect to any Oracle Database version 9.2.0.1 and later. Support for this release is provided via an OTN Discussion Forum. Go to the Raptor Project Page on Oracle Technology Network. 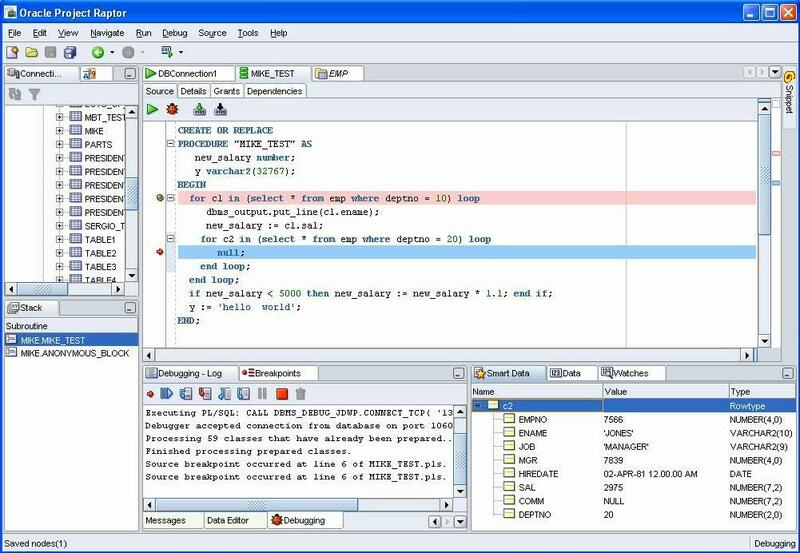 Project Raptor was developed in Java leveraging the Oracle JDeveloper IDE framework. Default connectivity to the database is through the JDBC Thin driver (no Oracle Home required); the JDBC Type 2 driver (OCI client side driver) is also supported. Raptor is bundled with JRE 1.5 (with an additional tools.jar to support debugging). Installation is performed simply by unzipping the downloaded file. There is support for the Windows and Linux platforms today; Mac OS X support is planned for a future release. 1. Unzip the Raptor kit into a folder (directory) of your choice (for example, C:\Program Files). This folder will be referred to as . Unzipping the Raptor kit causes a folder named raptor to be created under the folder (for example, C:\Program Files\raptor). It also causes many files and folders to be placed in and under that directory. 2. To start Raptor, go to <raptor_install>\raptor, and double-click raptor.exe. My first impressions: installation is really as simple as it is made out to be (just like JDeveloper in fact): unzip and run. Took about 5 minutes – it is a big archive to unzip. Setting up a Connection is very simple. A familiar Database Object Tree or Navigator is shown. You can quickly inspect the objects available under the connection that was just created. Multiple connections can be created and can coexist. Raptor has a SQL Window, where statements can be edited and executed. During editing, it provides Code Insight – for example offering a list of available columns when you have typed table alias.. Code Completion is invoked with CTRL+Space. It shows a list of Tables, Views, Functions, Procedures and Packages available to the current connection. Executing the script with F6 or clicking on the 5th button in the button bar will display the Explain Plan results. 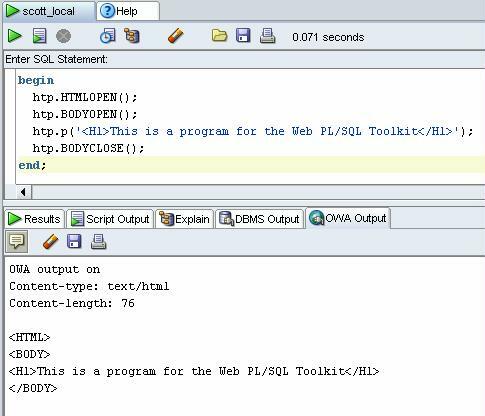 It is good for SQL Developers to have that at their fingertips… The tab OWA Output presumably – though I did not find anyhing about it in the help – shows the results of htp.p commands used in code to be run with the PL/SQL WebToolkit. I had hoped it would show the interpreted HTML, instead it returns the full HTML. Still, it can be useful. A production release of Project Raptor is scheduled for early 2006. The production release will be supported by Oracle Support for any customer with a current Oracle Database support contract. The enhancements made for Raptor will be included in a future release of Oracle JDeveloper (post 10.1.3). 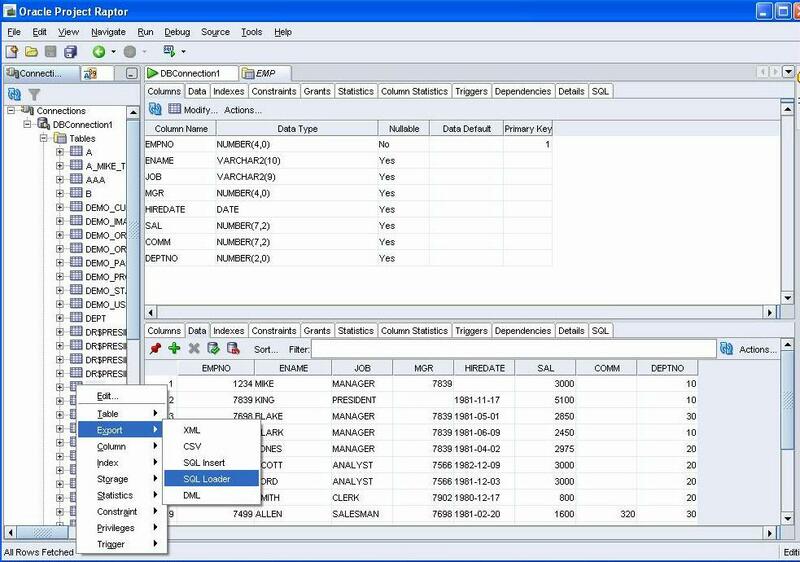 Aqua data studio can handle different types of databases. As allround DBA (not restricted to Oracle) this is the better tool. So far it has been the best I can find on OS X. The PL/SQL support is not that good, but it is more then half decent. 3. stability: it hasn’t crashed on my Mac uptill now. Still run in a lot of “features” / aka bugs which were related on XMLType objects. in a relational object instead of an identical copy of the source. Oracle Project Raptor is first graphical software which facilitate the oracle developer an DBA. b/c this software is 2 dimentional one for dba and second for developers. But i am confuse to compare Aqua Data Studio 4.0 and oracle project raptor . Please, inform me basic difference between Aqua Data Studio 4.0 and oracle project raptor. I shell waite for ur respon . The JRE is explained here. If you use a standard jre the debugger will not work. I also like the reports that, although I could not get all the queries to work, provides a wide range of database information like the version nls-language support, xml schema’s, table information and much more. Looks like I won’t need to renew my licenses for Toad (by Quest Software) any more. Not requiring an oracle home is a big plus too. This may just be the tool I have been looking for to use under Linux. So far I used Toad under Windows but unfortunately it won’t run under Linux (I haven’t tried wine to get Toad working). Now it runs from wherever I invoke the script.